Oh! A surprise! 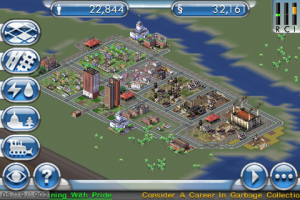 I was ready to delete SimCity from my phone, but decided I should give it a chance first. I loaded up Tutorial City, which I’d carried on playing after it had taught me all it knew, and built a fire station. And a house for me. And Big Ben. And then I worried about how to balance the budget. And then I noticed loops of road and rail weren’t actually connected up properly and I wondered how to fix that. And then I saw demand for Industrial was very high and wondered where to put more of that, because I didn’t want to ruin my residential land prices. So, yeah, SimCity is staying on my phone for now. I’ll probably not play it again for months, but it’s a good game and it’s nice to know it’s there.